American Muscle, Mickey Thompson, And Wild E. – Pick Our Wheels! In the interest of giving Project Wild E. Coyote a fresh look, we’ve teamed up with the guys at American Muscle and Mickey Thompson Tires to present a number of different, affordable cast wheel designs. Instead of us picking out the wheels and just rolling with them (no pun intended), American Muscle sent us four of their hottest styles, and we’ve installed each set onto the car to give you a firsthand look at the design, fitment, and construction. In conjunction with the rest of our readers, you’ll get to pick which ones you like best in a first-ever StangTV poll, and the winning set of wheels will be implemented onto Wild E. for a number of our upcoming articles on the project! 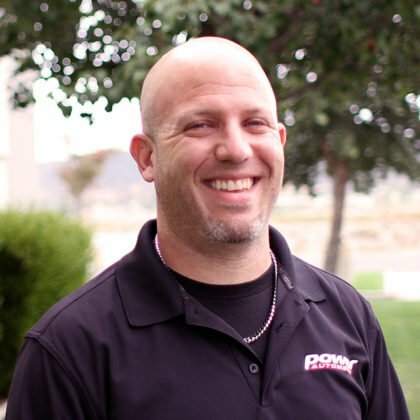 Power Automedia technician Cody Lynn was responsible for the installation of all four set of wheels - a time-consuming task, but one we think paid solid dividends. Thanks Cody! As one of the largest aftermarket suppliers of performance and appearance goods for the Mustang, American Muscle has a pretty good handle on the business of making late-model Mustangs look good. We chose four of their hottest designs to take place in this poll, in a fitment that looks stunning on every S197 2005-14 Mustang out there. All 2005-14 Mustangs have a 5×4.5 (114.3mm) bolt circle, giving us a wide range of potential wheel selections to choose from, and all four wheels in our article will fit on any Mustang built during the S197 model run. But before we get started, a bit of technical review on fitments is below. Top Left - The American Muscle Charcoal AMR wheel offers drift-car-inspired styling and is covered in a sweet dark charcoal color. Bottom Left - Forgestar's F14 comes in five different finishes - the Matte Black we chose, along with Piano Black, Textured Black, Gunmetal, and Silver. Top Right - AM's Laguna Seca wheels takes its inspiration from the legendary BOSS 302 Laguna Seca model and is the only wheel in our face-off that has a machined/painted/clear coated finish. Bottom Right - The Forgestar CF5V Monoblock wheel is available in Matte Black, Piano Black, and Gunmetal finishes - we chose the Gunmetal finish for the sleek concave V-spoke wheel. Despite what you may have heard, backspace and offset are not the same thing – they are two different measurements of two different dimensions on the wheel. Backspacing is measured in inches, and is done by placing the wheel face-down (on a soft surface to not mar the finish). Place a straight edge across the rear face of the wheel, the measure down to the mounting face on the wheel hub. The higher the backspace number (say, 7.4-inch versus 5.93-inch), the more the wheel will tuck underneath the fender of the car. Offset, on the other hand, is measured in millimeters, and is the distance between the wheel mounting surface (where they are bolted to the hub) and the centerline of the wheel. A wheel mounting surface that is closer to the outside face of the wheel is considered to be a “positive” offset wheel, while a wheel where the mounting face is further to the inboard lip of the wheel is considered to have a “negative” offset. The centerline of the wheel, say 4.5-inches on a 9-inch rim is considered the zero point. Most front-wheel-drive cars and many of today’s rear wheel drive cars like our Mustang have a positive offset. A positive offset wheel is designed to have a flat face and basically wrap around the braking system of the car while providing a wider track for more stability. Old-school wheels had a negative offset, and thus more depth – but less strength in the wheel’s construction. Forgestar uses a process called Flow Forming that lightens and strengthens the wheel. The machine pulls and shapes the wheel to create the final profile. According to American Muscle, the rim actually “flows” down into place to create the final rim width. The pressure of the shaping operations to the cast wheel changes its mechanical properties, ending up with a final product that has strength and impact values similar to those of a hot-forged wheel and has proven itself in thousands of applications both on the street and at the track. Flow Forming creates a wheel that has a weight reduction of up to 15 percent over a traditional cast wheel. In addition, after forming, the wheel is heat-treated to improve dent resistance without increasing its weight – and we all know that less rotating weight is good, no matter the application. These wheels are compatible with tire pressure sensor monitors and have plenty of clearance for nearly any high-performance brake system on the market. They carry a lifetime structural warranty to the original purchaser. We have two different Forgestar wheels lined up for this project – the F14 and the CF5V. The Forgestar F14 wheel is a one-piece aluminum wheel that features a mesh-look race-inspired design, combining 14 spokes with a concave center to provide a sweet appearance. We chose the Matte Black finish that’s powdercoated onto the wheel, offering durability that will last the life of the wheel. In addition, it has the added benefit of shedding brake dust – the enemy of aftermarket wheels. The Forgestar F14 was used in a 19x9F/19x11R fitment. This is the only wheel design we chose to run with the 11-inch rear, and we’d have to say they look pretty awesome with our M/T meats. For our application, American Muscle recommended the 19x9F [PN 29600] and 19x11R [PN 29866] fitment to be used. Fender lip clearance with the F14 fitment is just right with the wheel sitting in the sweet spot. The 19×9 front wheel uses a 6.4-inch backspace and +35mm offset to sit properly in the wheel well, giving us a tucked look that aligns properly with the fender lip for a killer look. At only 24.9 pounds per wheel, they are light and strong – exactly what you want in a street wheel. The rear fitment of 19×11 is the only 11-inch rear wheel we used for this article, and carries an 8.2-inch backspace and +56mm offset, putting both wheels in the proper place visually so everything appears correct when mounted onto the car. The rear wheel weighs the same 24 pounds as the front fitment. The 19×11 rear wheel has a more concave appearance in the rear to get to the correct place under the car. When it came time to choose the second Forgestar design, we picked the CF5V, which is a split five-spoke design (hence the V in the name). As with the F14 design, these are crafted using Forgestar’s Rotary Forged Flow Forming process to ensure light weight and high strength. The Forgestar CF5V provides a different look than the F14 - more European in our opinion. We dig the Gunmetal finish. The CF5V is available in a 19x9F [PN 29858] and 19x10R [PN 29859] for the 2005-14 Mustang. The 19×9 front fitment has a 6.4-inch backspace and +35mm offset, and like the F14 has a powder coated finish – this time in Gunmetal, to give you a different look to choose from in our poll. Closeup of the CF5V fitment. The 19×10 rear wheels use a 7.1-inch backspace and +42mm offset to place them properly in the rear wheel well. The concave look of the 10-spoke wheel looks sharp no matter what color your car is. One thing to note about both of the Forgestar designs is that the factory 13/16-inch-head lug nuts won’t fit neatly into the wheel without worry of damaging the wheel’s finish during the installation process, necessitating the purchase of a new set of lug nuts. Luckily American Muscle sells both acorn and six-spline-drive 3/4-inch head lug nuts in chrome or black finishes, making an upgrade easy. Our third option came straight from the design team at American Muscle in the form of their slick-looking AMR wheel design. All of American Muscle’s in-house designs are built using a gravity-casting process where molten aluminum is poured into the mold and then machined into its final shape. The American Muscle AMR wheels use a split-7-spoke design -the spokes split just after the hub area of the wheel to form 14 spokes at the rim lip. The AMR wheel on Wild E Coyote, like the rest of our choices, is a staggered front-to-rear arrangement. All of these wheels can also be used in a standard arrangement - the wheels we are using on the front will fit all four corners properly and allow the use of one tire size to maximize tire life. The wheels are finished in a Matte Charcoal powder coated finish that looks great and lasts, with American Muscle offering a one-year-warranty on the finish. The wheel itself carries a lifetime structural warranty. The Matte Charcoal finish on the AMR wheel sets off nicely with Wild E.’s Sterling Grey Metallic hue. Our fitment in this wheel design was done using a 19×8.5F [PN 28336G05] and 19x10R [PN 28387]. However, if you’re looking to keep it so that you can rotate your tires, the front wheel fitment can be used at all four corners along with the corresponding same-size tire, which is recommended for that fitment with a 245/45/19 or 255/40/19 tire. The front wheels use a 5.93-inch backspace and +30mm offset. On the rear fitment, they use a 7.4-inch backspace with +48mm offset to achieve the sweet look. Front wheels weigh in at 26.9 pounds, while the rears tip the scale at 27.1 pounds. The last option we set up to check out on the car is inspired by the design of Ford’s own Laguna Seca BOSS 302 Mustang from the 2013 model year. They are produced by American Muscle to mimic the look of the BOSS 302 wheels and are produced in the same size 19x9F [PN 99224G05] and 19x10R [PN 99225] fitments as the AMR wheel. The Laguna Seca rim is based on the BOSS 302 Laguna Seca-model Mustang and aims to recreate that design. These are also our only non-powder coated choice of our four test wheels, as they have a split-five-spoke design that has a machined and painted finish applied. The face of the spokes is machined to have a bare-aluminum look, while the inlays have been finished in black for a nice contrast. The Laguna Seca wheel is the only non-powdercoated wheel in our lineup, and provides a different look under the flanks of our Mustang. These also differ in the backspacing and offset department, with 6.65-inch front 7.37-inch backspacing for the rear wheel. Offsets are +42mm front and +47.5mm in the rear. Again, the 19×9 wheel can be used at all four corners for a one-size fitment, if the staggered look isn’t for you. The entire wheel is covered in satin clear-coat to protect them from damage, which carries a one-year-warranty. As with the AMR wheel, the structural component is covered for life. We’ve used Mickey Thompson Tires’ Street Comp Ultra High Performance tires on Project Wild E. Coyote in the past and been very happy with their performance (in an 18-inch fitment), so the decision was made to hook up with a fresh set of meats for this project. MIckey Thompson’s Street Comp UHP tires can be purchased straight from American Muscle as part of your wheel and tire package. We’ve used them previously with great success. American Muscle offers a number of different tire fitments for each of these wheel designs, and has an in-house mounting and balancing department for you to take advantage of if you purchase a wheel and tire package. The best part? The mounting and balancing is free with the purchase of the package. During the wheel selection process on their website, you’ll be asked to choose whether you need Tire Pressure Monitoring Sensors (’07-newer), the TPMS tool (required to sync the sensor kit to your car), and whether you’d like new lug nuts and a new lug nut wrench. They’ll even fill your new tires with nitrogen, which lasts longer than just injecting traditional compressed air into the tire. Your new wheels and tires will arrive to your house mounted, balanced with hidden weights, and ready to be unpacked and bolted on – it doesn’t get much simpler than that. “Many of the late model machines serve double-duty as street/strip cars. Some of these street/strip cars used our sticky tires on the rear with another brand on the front since we did not have a high performance front tire application. The Street Comp was the perfect addition to the product line, both for those who are looking for a High Performance Product on all four corners and/or one to pair with their Sticky Mickey Thompson rear tires. The Street Comp is by no means a “drag radial”; it provides superior wet and dry performance, excellent cornering capability, a smooth ride and is available in many popular sizes at a competitive price,” explains Jason Moulton, Mickey Thompson Tires’ Product Development Manager. In the front, we picked out the 255/40/19 tire [AM PN 79539]. This size, along with our rear choice of 285/35/19 [AM PN 79540], is sold with a speed rating of Y, which means that the tire is capable of handling a sustained maximum speed capability of 186 mph although we don’t expect to see that too often on the SoCal freeway. The front tire is recommended to be used on rim 8.5 to 10.0-inches wide and has a 9.1-inch tread width, while the rear tire is recommended with rims from 9.5 to 11.0-inches wide. Overall diameter on the front tire is 27 inches, while the rear checks in at 26.9 inches – but don’t worry, that tenth of an inch difference is not visible when the wheels and tires are mounted on the car, so don’t think your car’s going to have a weird rake to it. It comes out to about a 1/16-inch difference, which you’ll never notice - and is in fact the OE fitment on the 2010-2013 Shelby GT500 Mustang. “The circumferential grooves are shifted to the inside of the pattern by 4% of the tread arc width to optimize the tire for dry handling and traction. The outside shoulder and intermediate tread elements are 30% larger, which also aids in increased dry-weather handling and ultimate cornering capability, while the solid center rob provides crisp steering response. Also, the inside area of the tire has 30% more lateral grooves, which helps the tire to maintain wet performance,” Moulton explains. For one week after this article is published, you have the ability to vote on which wheel style you like most on the StangTV Facebook page, or, as an alternative, you can also comment right here at the bottom of this page. We’ll calculate the results, install the winning choice onto the car, and you’ll get to see them rock out over a number of our upcoming articles on Wild E. Coyote.